Hugh is a Senior Software Engineer and Certified Scrum Master based in Galway, Ireland. He achieved his B.Sc. in Applied Computing from Waterford Institute of Technology in 2002 and has been working in industry since then. He has worked for a several large blue chip software companies listed on both the NASDAQ and NYSE. EDITORIAL NOTE: In this post, we feature a comprehensive Abstraction in Java Tutorial. Abstraction occurs during class level design, with the objective of hiding the implementation complexity of how the the features offered by an API / design / system were implemented, in a sense simplifying the ‘interface’ to access the underlying implementation. This process can be repeated at increasingly ‘higher’ levels (layers) of abstraction, which enables large systems to be built without increasing the complexity of code and understanding, at higher layers. An interface is like a contract. It is a promise to provide certain behaviours and all classes which implement the interface guarantee to also implement those behaviours. To define the expected behaviours the interface lists a number of method signatures. Any class which uses the interface can rely on those methods being implemented in the runtime class which implements the interface. This allows anyone using the interface to know what functionality will be provided without having to worry about how that functionality will actually be achieved. The implementation details are hidden from the client, this is a crucial benefit of abstraction. Here we see an interface called MyInterface defined, note that you should use the same case conventions for Interfaces that you do for Classes. MyInterface defines 3 methods, each with different return types and parameters. You can see that none of these methods have a body; when working with interfaces we are only interested in defining the expected behaviour, not with it’s implementation. Note: Java 8 introduced the ability to create a default implementation for interface methods, however we will not cover that functionality in this tutorial. All the methods in an interface are public by default and in fact you can’t create a method in an interface with an access level other than public. Now we have defined an interface we want to create a class which will provide the implementation details of the behaviour we have defined. We do this by writing a new class and using the implements keyword to tell the compiler what interface this class should implement. We took the method signatures which we defined in MyInterface and gave them bodies to implement them. We just did some arbitrary silliness in the implementations but it’s important to note that we could have done anything in those bodies, as long as they satisfied the method signatures. We could also create as many implementing classes as we want, each with different implementation bodies of the methods from MyInterface. We implemented all the methods from MyInterface in MyClass and if we failed to implement any of them the compiler would have given an error. This is because the fact that MyClass implements MyInterface means that MyClass is guaranteeing to provide an implementation for each of the methods from MyInterface. This lets any clients using the interface rely on the fact that at runtime there will be an implementation in place for the method it wants to call, guaranteed. We see something unusual above, instead of something like MyClass object1 = new MyClass(); (which is perfectly acceptable) we declare object1 to be of type MyInterface. This works because MyClass is an implementation of MyInterface, wherever we want to call a method defined in MyInterface we know that MyClass will provide the implementation. object1 is a reference to any runtime object which implements MyInterface, in this case it’s an instance of MyClass. If we tried to do MyInterface object1 = new MyInterface() we’d get a compiler error because you can’t instantiate an interface, which makes sense because there’s no implementation details in the interface – no code to execute. When we make the call to object1.methodA() we are executing the method body defined in MyClass because the runtime type of object1 is MyClass, even though the reference is of type MyInterface. We can only call methods on object1 that are defined in MyInterface, for all intents and purposes we can refer to object1 as being of type MyInterface even though the runtime type is MyClass. In fact if MyClass defined another method called methodD() we couldn’t call it on object1, because the compiler only knows that object1 is a reference to a MyInterface, not that it is specifically a MyClass. This important distinction is what lets us create different implementation classes for our interfaces without worrying which specific one is being called at runtime. It defines one void method which takes no parameters. The runtime type of this class is ClassB. We have successfully used the same Reference (myObject) to refer to instances of two different runtime types. The actual implementation is completely unimportant to the compiler, it just cares that OneMethodInterface is implemented, by anything, and in any way. As far as the compiler is concerned myObject is a OneMethodInterface, and oneMethod() is available, even if it’s reassigned to a different instance object of a different class type. This ability to provide more than one runtime type and have it resolved at run time, rather than compile time, is called polymorphism. Interfaces define behaviour without any implementation details (ignoring Java 8) and implementing classes define all the implementation details for the classes they define, but what happens if we want a mix of the two concepts? If we want to mix some behaviour definition and some implementation together in the same place we can use an abstract class. An abstract class is like an incomplete blueprint, it defines some of the implementation details of the class while leaving others as simple behaviour definitions to be implemented later. Imagine a blueprint of a house where the house is drawn in completely but there is a big empty square where the garage will go. We know there will be a garage but we don’t know what it will look like. Somebody else will have to take a copy of our blueprint and draw in the garage. In fact several different people may take copies of our blueprint and draw in different types of garage. Houses built using these blueprints will all be recognizable variants of our house; the front door, the room layouts and the windows will all be identical, however the garages will all be different. Much like the blueprints above our abstract classes will define some methods completely, and these method implementations will be the same in all implementations of the abstract class. The abstract class will define only the signature for other methods, in much the same way that interfaces do. The method implementations for these methods will vary in the implementing classes. An implementing class of an abstract class is commonly referred to as a concrete class. Due to the inheritance relationship between the concrete class and the abstract class we generally say that a concrete class extends an abstract class, rather than implements it as we say with interfaces. Just like with interfaces any client code knows that if a concrete class is extending an abstract class the concrete class guarantees to provide method bodies for the abstract methods of the abstract class (the abstract class provides it’s own method bodies for non-abstract methods, of course). Again, just like interfaces, there can be several different concrete classes of a given abstract class, each may define very different behaviours for the abstract methods of the abstract class while satisfying the contract of the abstract class. The implementation details are hidden from the client. The keyword abstract is used to define both a class and its methods as abstract. Here we have defined an abstract class called MyAbstractClass which contains an integer and provides a method for incrementing that integer. We also define an abstract method called doSomethingWithNumber(). We don’t yet know what this method will do, it will be defined in any concrete classes which extend MyAbstractClass. doSomethingWithNumber() doesn’t have a method body because it is abstract. In interfaces all the methods are public by default, however the scope of an abstract method may be public, package or protected. You can see that some behavioural implementation in increment() is mixed with some behavioural definition in doSomethingWithNumber() in this abstract class. Abstract classes mix some implementation with some definition. Concrete classes which extend Abstract class will reuse the implementation of increment() while guaranteeing to provide their own implementations of doSomethingWithNumber(). Now that we have created an abstract class let’s make a concrete implementation for it. We make concrete implementations from abstract classes by using the extends keyword in a class which itself is not abstract. We have created a concrete class called MyConcreteClass and extended MyAbstractClass. We only needed to provide an implementation for the abstract method doSomethingWithNumber() because we inherit the non private member variables and methods from MyAbstractClass. If any client calls increment() on MyConcreteClass the implementation defined in MyAbstractClass will be executed. We also created a new method called sayHello() which is unique to MyConcreteClass and wouldn’t be available from any other concrete class which implements MyAbstractClass. We can also extend MyAbstractClass with another abstract class where we don’t implement doSomethingWithNumber – this means that another concrete class will have to be defined, which extends this new class in order to implement doSomethingWithNumber(). We didn’t have to make any reference to doSomethingWithNumber() here, whenever we create a concrete class for MyOtherAbstractClass we will provide the implementation for doSomethingWithNumber(). Lastly, abstract classes can themselves implement interfaces. Because the abstract class can’t be instantiated itself it does not have to provide an implementation for all (or any) of the interface methods. If the abstract class does not provide an implementation for an interface method, the concrete class which extends the abstract class will have to provide the implementation. Here we see that MyImplementingAbstractClass implements MyInterface but only provides an implementation for methodA(). If any concrete class extends MyImplementingAbstractClass it will have to provide an implementation for methodB() and methodC() as defined in MyInterface. Just like with Interfaces and regular classes, to call the methods of an abstract class you use the dot (.) operator. Again we see that object1 is a reference to an instance that provides a concrete implementation for MyAbstractClass and the runtime type of that instance is MyConcreteClass. For all intents and purposes object1 is treated by the compiler as if it is a MyAbstractClass instance. If you were to try to call the sayHello() method defined in MyConcreteClass you would get a compiler error. This method is not visible to the compiler through object1 because object1 is a MyAbstractClass reference. The only guarantee object1 provides is that it will have implementations for the methods defined in MyAbstractClass, any other methods provided by the runtime type are not visible. As with interfaces we can provide different runtime types and use them through the same reference. It defines one implemented method an another abstract method. oneMethod is implemented in TwoMethodAbstractClass. twoMethod is implemented in ConcreteClassA. ConcreteClassB implements its own twoMethod. We have used the same reference (myObject) to refer to instances of two different runtime types. When the runtime type of myObject is ConcreteClassA it uses the implementation of twoMethod from ConcreteClassA. When the runtime type of myObject is ConcreteClassB it uses the implementation of twoMethod from ConcreteClassB. In both cases the common implementation of oneMethod from TwoMethodAbstractClass is used. Abstract classes are used to define common behaviours while providing contracts or promises that other behaviours will be available from a concrete class later. This allows us to build object models where we can reuse common functionality and capture differing requirements in different concrete classes. We have been asked to build a payments system for a company. We know that the company has different types of employees that can be paid in different ways; salaried and with commission. The boss of the company understands that his needs will change and the system may be changed later to accommodate different types of entities which will receive payments. Let’s start by considering the employees. They must receive payments, but we also know that later on we may need to have different entities also receive payments. 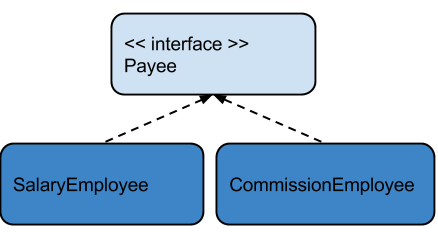 Let’s create an interface, Payee, which will define the sort of behaviour we’d expect from entities which can receive payments. Here we have a Payee interface which guarantees three behaviours; the ability to provide a name for the Payee, the ability to provide a gross payment amount which should be paid and the ability to provide a bank account number where the funds should be deposited. Now that we have a Payee defined let’s write some code that uses it. We’ll create a PaymentSystem class which maintains a list of Payees and on demand will cycle through them and transfer the requested amount into the appropriate bank account. You can see that the PaymentSystem is totally agnostic as to the runtime types of the Payees, it doesn’t care and doesn’t have to care. It knows that no matter what the runtime type the Payee being process is guaranteed to implement name(), grossPayment() and bankAccount(). Given that knowledge it’s simply a matter of executing a for loop across all the Payees and processing their payments using these methods. We have been told by the boss that he has two different types of Employee – Salaried Employees and Commissioned Employees. Salaried Employees have a base salary which doesn’t change while Commissioned Employees have a base salary and also can be given sales commissions for successful sales. Let’s start with a class for Salaried Employees. It should implement the Payee interface so it can be used by the Payment System. Let’s represent our changes using class diagrams in addition to code. In class diagrams a dotted arrow means an ‘implements’ relationship and a solid arrow means an ‘extends’ relationship. Now let’s make a CommissionEmployee class. This class will be quite similar to the SalaryEmployee with the ability to pay commissions. As you can see a lot of the code is duplicated between SalaryEmployee and CommissionEmployee. In fact the only thing that’s different is the calculation for grossPayment, which uses a commission value in CommissionEmployee. Some of the functionality is the same, and some is different. This looks a like a good candidate for an Abstract Class. Let’s abstract the name and bank account functionality into an Employee abstract class. 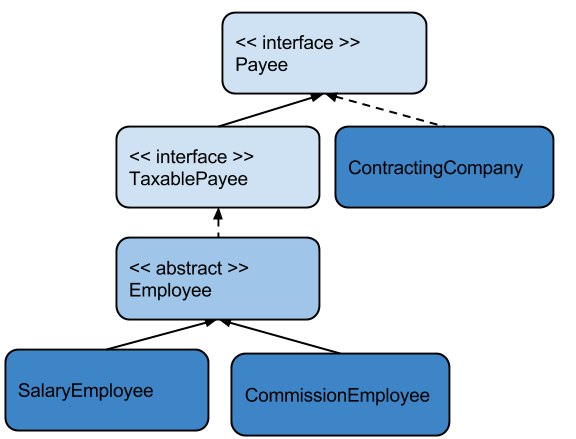 SalaryEmployee and CommissionEmployee can then extend this abstract class and provide different implementations for grossPayment(). 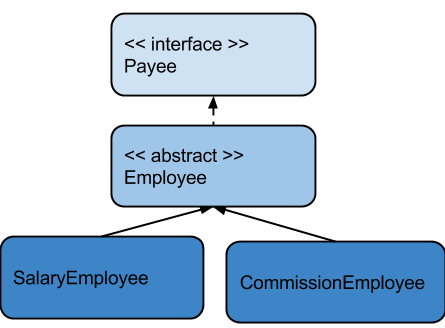 Note that Employee doesn’t have to implement the grossPayment() method defined in Payee because Employee is abstract. Let’s try using our new Employee types in an application. We’ll create an application class that initializes the system by creating a Payment System, some Employees and simulating a week of work. We create two commissioned employees and two salaried employees, each with their own names, base wages and bank account numbers. We load each of the employees into the Payment System we created. We then simulate a week by giving commissions to the two commissioned employees and then ask the Payment System to process all the payments for the week. The boss is very happy with the system so far, but he’s told us that in order to motivate his employees he wants the ability to give them weekly percentage bonuses. He tells us that because Commissioned Employees are typically on a lower salary we should give them a bonus multiplier of 1.5x in order that their percentage bonus is bumped up. The bonus should be reflected in the gross payment of each employee. Let’s add a field to employee to capture any bonuses that are given, a protected method to return and reset the bonus and an abstract method to give the bonus. The doBonus() method is protected so that it can be accessed by the concrete Employee classes. The giveBonus method is abstract because it will be implemented differently for Salaried and Commissioned Employees. We can see that both classes implement giveBonus() differently – CommissionEmployee uses the bonus multiplier. 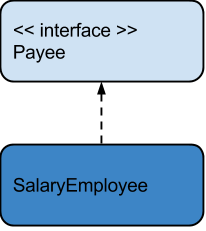 We can also see that both classes use the protected doCurrentBonus() method defined in Employee when working out the gross payment. The Gross amounts now reflect the bonuses paid to the employees. The boss is delighted with the Payment System, however he’s thought of someone else he needs to pay. From time to time he will engage the services of a contracting company. Obviously these companies don’t have wages and aren’t paid bonuses. They can get several one off payments and when processed by the payment system should be paid all cumulative payments and have their balance cleared. 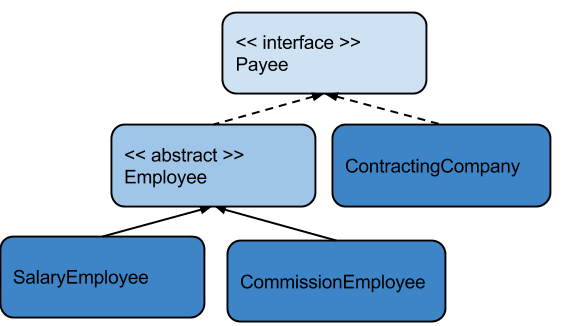 The ContractingCompany class should implement Payee so it can be used by the Payments System. It should have a method for paying for services which will be tracked by a cumulative total and used for payments. We have now successfully added a brand new type of Payee to the system without having to change one single line of code in the PaymentSystem class which handles Payees. This is the power of abstraction. The boss is over the moon with the Payment System, however the taxman has sent him a letter telling him that he has to incorporate some sort of tax withholding into the system or he’ll be in big trouble. There should be a global tax rate for the system and each employee should have a personal tax free allowance. The tax should only be collected on any payments made to an employee over and above the tax free allowance. The employee should then only be paid the net amount of payment due to them. Contracting Companies are responsible for paying their own tax so the system should not withhold tax from them. In order to handle taxation we’ll need to create a new, special, type of Payee which is taxable and can provide a tax free allowance figure. In Java we can extend interfaces. This let’s us add behaviour definitions without modifying our original interface. All of the behaviour defined in the original interface will be automatically carried into the new interface. We’ll extend Payee to create a new TaxablePayee interface, we’ll then have Employee implement that interface, while letting ContractingCompany remain as a regular, untaxed, Payee. Here we see that Payee is extended and an additional method is defined – allowance() which returns the tax free allowance of the TaxablePayee. We’ll now need to update Employee to implement TaxablePayee and we will see that this will have a knock on effect on both concrete Employee classes. We have had to change the constructor of Employee which implies that the constructors of our two abstract classes will also need to change. We now need to update PaymentSystem to withhold tax and to do this we’ll need some way of determining if a given Payee is a TaxablePayee or a regular Payee. We can take advantage of a Java keyword called instanceof to do this. Instanceof lets us check to see if a given reference variable’s runtime type matches a test type. It returns a boolean and can be called like so: if (object1 instanceof MyClass). This will return true if object1’s runtime type is MyClass or a subclass or implementing class (if MyClass is an interface) of MyClass. This means we can test anywhere along the inheritance tree making it a very powerful tool. We can use this tool to determine if a given Payee is an instance of a TaxablePayee and take appropriate measures based on that knowledge. The new code first checks if the Payee being processed is an instance of TaxablePayee, if it is it then does a cast on the Payee to treat it as a reference to a TaxablePayee for the purposes of accessing the allowance() method defined in TaxablePayee. Remember; if the reference stayed as a Payee the allowance() method would not be visible to the PaymentSystem because it is defined in TaxablePayee, not Payee. The cast is safe here because we have already confirmed that the Payee is an instance of TaxablePayee. Now that PaymentSystem has the allowance it can work out the taxable amount and the tax to be withheld based on the global tax rate of 20%. If the Payee is not a TaxablePayee the system continues to process them as normal, not doing anything related to tax processing. As you can see tax is calculated and withheld for Employees, while Contracting Companies continue to pay no tax. The boss couldn’t be happier with the system and is going to gift us an all expenses paid vacation for keeping him out of jail! Abstraction is a very powerful tool in Java when used in the correct way. It opens up many possibilities for advanced java use and for building complex, extensible and maintainable software. We have just scratched the surface of what abstraction can do for us and hopefully built a foundation for learning about the different ways abstraction can be used in more detail. 28 Comments Views Tweet it! After you enter a VALID email address, you will need to verify your subscription. you will get a final welcome email which will contain the links to download the ebooks! If you are subcribed and still you haven’t got the link send us a message at support[at]javacodegeeks.com and we will help you. It has a very good explanation and I got few points cleared. Nice article, I found it useful and informative. Duarte – please keep in mind that the authors of these articles don’t necessarily get to choose the title under which they appear, so maybe cut Hugh some slack for the possibly hyperbolic title. Thanks for the free article! I have a minimum criticism. Article says “Interfaces can also contain state data by the use of member variables” but I could compile its source example at Java 8 (and I’m pretty sure I would not be able to compile at earlier Java versions too). At least if I didn’t attribute some value to the variable. Hey, stop deleting user comments!!! Where’s the PDF download? the article claims to have it, but it’s no where to be found, just buttons to subscribe. I’ve already subscribed and can’t find the link. You could at least comment to my comment, but deleting them is just BS. Users comments are never deleted, it just takes some time to approve them. If you have subscribed and not received an email yet, shoot us a message at support[at]javacodegeeks.com and we will help you. where is the pdf link? i cant find on this page. Yes, I am already subscribed. is the book for only the new subscriptions? Hello,I have subscribed and not received any email to download it. What should i do? Hello, I have subscribed this morning and not received any email to download it. What should i do? Hello, send a message at support[at]javacodegeeks.com and we will help you. I really like the example of abstract classes, that with house and garage. Very clear and easy to understand! in CR of 4.7.1. Taxation changes in PaymentSystem (4.7.1) , you can do that more easy way by applying Taxable interface which leads separation of tax concern and more logical for these kind of context. Good example for the beginners. I would suggest , headfirst OOAD will be a very good source for abstraction knowledge. Very Nice! Thanks so much for your explanation. That helps.